With the glorious sound of Nordic Voices ringing in my ears, now it was all up to me. Whenever I’m dealing with words, it starts with a lot of analysis of the text, which then begins to generate specific musical ideas and gestures. I usually try to find a single image in a poem that becomes the musical foundation of the whole movement. 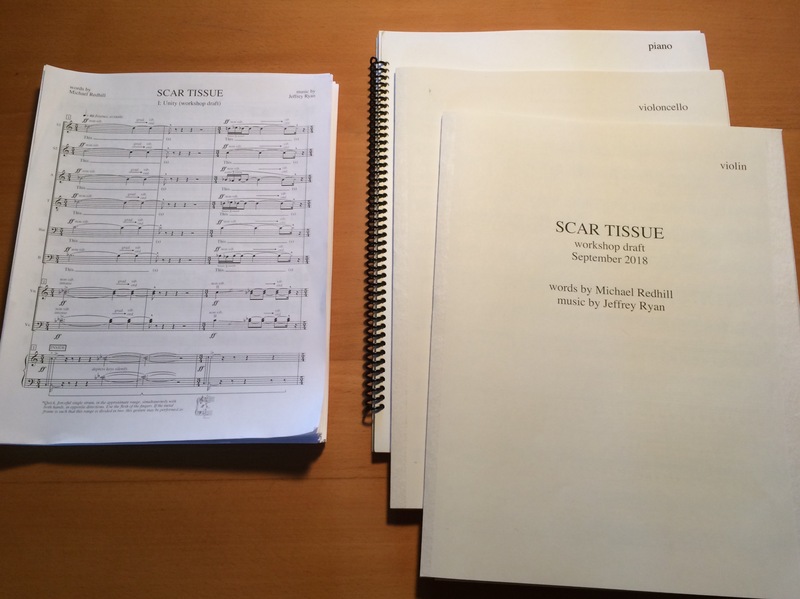 For Scar Tissue, being nine movements over 40 minutes, I also had to keep in mind the overall arc of the piece, and consider how the structure of the words might inform the use and reuse of musical materials. 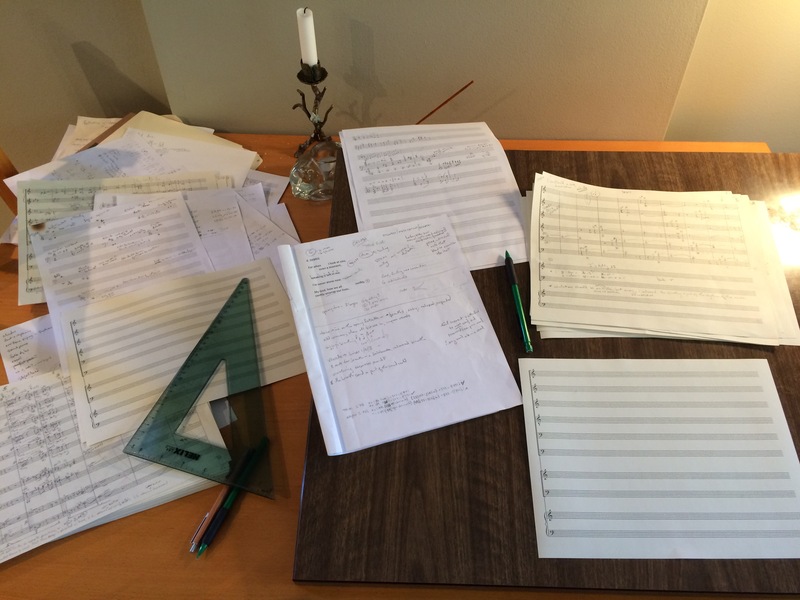 I knew that, as the line pattern in the poems was mirrored, the last movement of music would reflect and reinterpret elements of the first movement. I looked for phrases and images between poems that I wanted to connect motivically. I worked out how the piece would start in unity, then focus on each of the three instrumentalists in turn, gradually changing the combinations of voices to the central movement of maximum chaos and disruption, then putting it all back together again to close in a new unity. There is a huge amount of thought and work that has to happen before a single note of music gets written on the page. There’s more analysis of the poem than there is actual poem! It was extra fun that, along with scientific terms, poet Michael Redhill had included some music terms in the poetry as well. The seventh movement Relict mentions a “savage pianist” trying to “salvage” music. Relicts are things that survive from an earlier time. So I gave Jamie a workout, and wrote a movement that was a jaunt through the history of western art music. In succession, sometimes obvious and sometimes not, there are references to Bach (by way of The Partridge Family because of course), Beethoven, Chopin, Brahms, Debussy, Stravinsky, Shostakovich, Berg and finally Messiaen. Just as Michael’s poetry was infused with the voices of other poets, the music of this movement is infused with the voices of other composers. Day 1 of pencil to manuscript: April 6, 2018. I have to say, every moment of writing this piece was a joy, working with such brilliant text, picturing and hearing such amazing performers in my head. As promised, as each movement was finished, I copied it into the computer notation program, and sent it along through the miracle of the internet, so there was plenty of time to make adjustments based on the feedback from the singers. 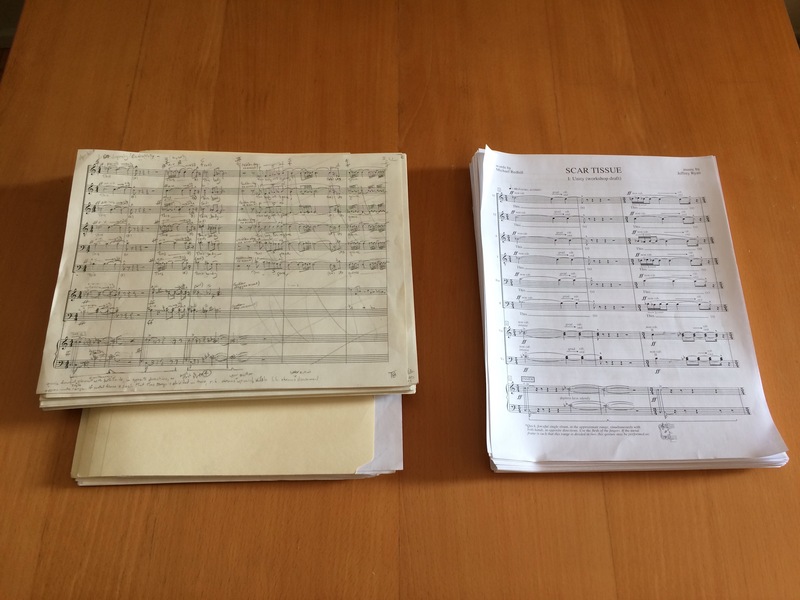 Finally, the piece was done (pencil down August 14, 2018), the full score was copied and assembled (it’s only 242 pages!) and the trio parts were formatted, printed and delivered in time for the September deadline. 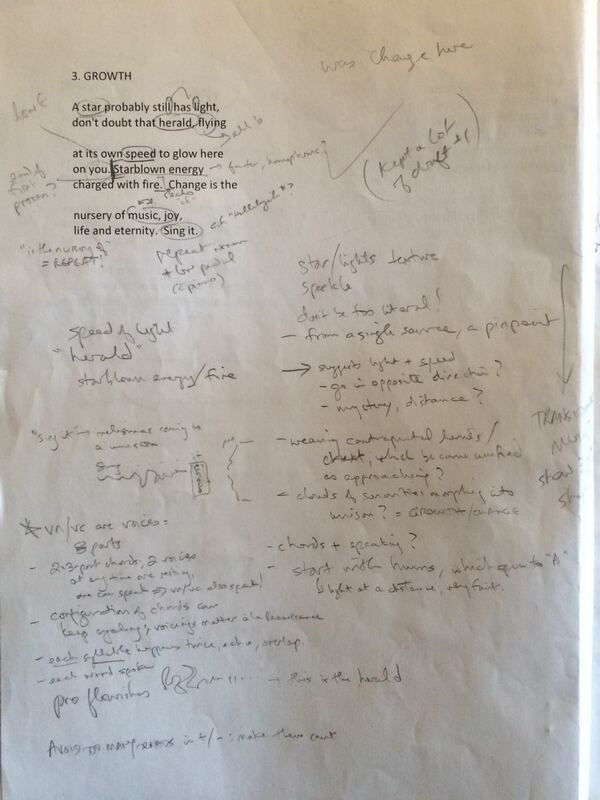 You may notice these say “Workshop Draft”—that’s for the next post. Thank you so much, Chrystiane! After such a long journey to bring a piece like this to the stage, it is gratifying to know that it touches people when it finally goes out into the world. I am so glad you were there to share in the experience with us!